Torchlight Frontiers Forged Class Unveiled with Trailer | Nerd Much? Perfect World Entertainment is excited to share new details on their recently announced project, Torchlight Frontiers. The studio confirmed a new class is debuting within the upcoming MMO, and they’ve shown it off today within the their Torchlight Frontiers Forged class reveal trailer. 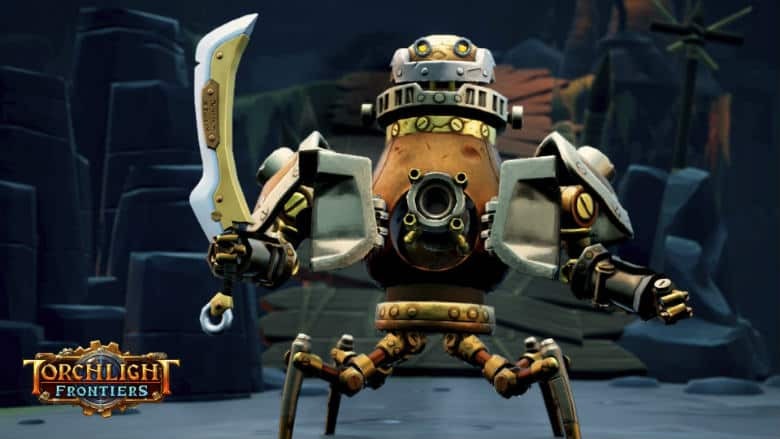 The developers describe the Torchlight Frontiers Forged class as an “awesome automaton” which “uses its arsenal of weaponry to build up heat before unleashing a devastating explosive attack on its enemies”. Today’s Torchlight Frontiers Forged class trailer gives us about a minute of footage of the new hero in action. The awesome automaton looks to have a good mix of close up and ranged attacks. He slices and dices those up close with his quick rotating attacks. And he can still launch plenty of projectiles to reach the foes that are beyond his blades reach. This likely isn’t the only new class that will be added to the series via Torchlight Frontiers. We’ll probably hear more on the new additions to the game from Perfect World and the team at Echtra Games further down the line. You can check out additional gameplay footage in the meantime that was released for Gamescom right here. We don’t know exactly when Torchlight Frontiers will head our way. It’s expected to land on PC at some point in 2019. Xbox One and PlayStation 4 versions will then follow after that.